It's far more than just taste... it's your family's health. Maryland's LOCAL Water Treatment Experts! Mr. Water Professional Water Treatment of Maryland is a LOCAL full service well and city water softening and conditioning company. We specialize in new equipment sales, service and repair of existing residential and light commercial water filtration and purification systems. We build our Patented well water treatment equipment out of high quality generic components and customize our installations. Water from an individual well and pump system can vary considerably and may contain unwanted substances like Calcium Hardness, Iron, Manganese, Hydrogen Sulfide (rotten egg) Sulfur Smell, Acidic (low pH) Water, Sediment (turbidity) or Nitrate and/or Bacteria contamination. What these United States Patents mean for our customers is a MAJOR LONG TERM COST SAVINGS over traditional water softening and conditioning equipment designs. 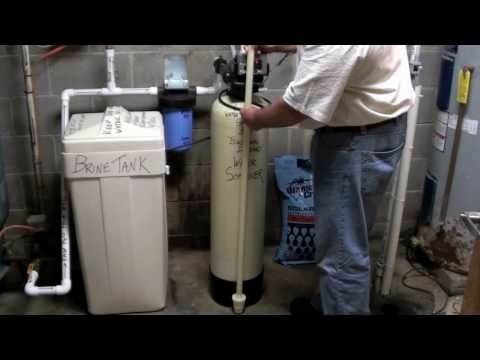 This amazing new technology has been in use now for over 10 years in various size configurations correcting extreme water chemistries - proven to permanently fix iron, sulfur (rotten egg smell) water, and hard water problems with one unique system. Why go to the expense and hassle of maintaining a basement full of water treatment equipment from another company when you can achieve the quality water you need with one simple system? Please don't consider purchasing well water softening and conditioning equipment from another manufacturer until you get a quote from us! Mr. Water LLC can professionally perform routine maintenance in your home or business for Culligan®, EcoWater®, RainSoft®, Kinetico®, and most other brand name systems using Fleck®, Clack®, or Autotrol® control valves. With over 31 years of experience in the water conditioning industry, we are very familiar with the water treatment systems commonly installed by local water purification and filtration dealers, plumbers, and well drillers in Maryland and the surrounding areas. For a small initial service fee of $60 we will do an in-home water analysis and test your well tank and pump system to make sure it has good water pressure and is functioning properly. Our expert technicians will then do an honest evaluation of your water conditioning system to determine what needs to be done to get the existing equipment you already have operating properly. If we find that your system is not working as it should we will recommend needed repairs, or a new high efficiency water filtration and purification system to permanently solve your water problems.